Home100-million-year-old wing tip features bones, soft tissue, and feathers preserved in amber. 100-million-year-old wing tip features bones, soft tissue, and feathers preserved in amber. Newly described bird wings—not just a single feather or a strange-looking fiber or two—rose to the top of a long list of spectacular amber-trapped fossils. Two tiny hatchlings may have seen dinosaurs just before their wings got trapped in fast-flowing tree resin. At least four waves of the magic evolutionary wand would be needed to shove these unique fossils into deep time. An international group of authors published technical details about the amber wings in the online journal Nature Communications.1 They identified modern-looking feather shafts, asymmetric flight feathers, brown coloration, and even skin and bone from the baby-bird wings. Some skin sections had decayed, looking clear and thin. Partial carbonization blackened other far less decayed skin sections, presumably from heating. The small feathers remain anchored in skin. Researchers tentatively identified the amber wing fossils as belonging to a group of extinct but fully formed birds called enantiornitheans. 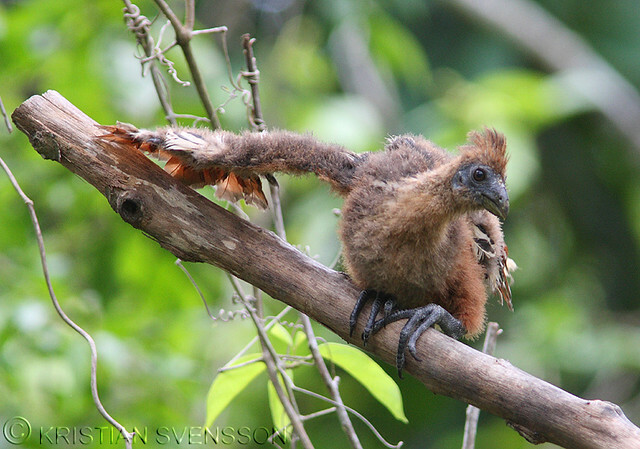 These powered flyers also had claws on their wings, like juvenile hoatzin from today’s Amazonian swamps. The Burmese amber is still clear enough to reveal minute details, including the baby feathers’ interlocking barbs and barbules. Ambers darken over time as they react with oxygen. After 100 million years, shouldn’t they all be completely dark, with no feathers or insects visible beneath the polished ancient amber’s opaque surface?3 It’s as though someone waved a magic wand over the amber to keep normal chemistry from happening. The two wing fossils preserve hardening lines, where pulses of resin flowed in big blobs and quickly formed an outer crust. Other pulses soon followed, each with its hardening line. Only severely damaged trees emit so much resin in such lump sums. Diggers have been extracting Burmese amber from deposits like Angbamo for decades. What caused all this resin to rapidly pour forth? Did the same catastrophic force that rent so many trees apart also transport these ambers and bury them in sediments? One would have to wave the magic wand yet again to cover the biodegradation problem these specimens present. Amber develops cracks as it hardens and dries. Cracks expose the interior to microbes. Some fungi even consume the chemicals that comprise amber itself.5 After 100 million years, shouldn’t microbes have consumed these rich organic sources many times over, leaving no specimen to study? And what about the total lack of evolutionary change in so many Burmese amber inclusions? They all look like today’s plants and creatures: fungi, flowers, grasses, ferns, bamboo fragments, click beetles, weevils, moths, grasshoppers, mayflies, caddisflies, lacewings, cockroaches, bark beetles, walking sticks, cicadas, plant bugs, bees, long-horn beetles, ichneumonid wasps, gnats, midges, queen ants, praying mantises, centipedes, millipedes, jumping spiders, ticks, scorpions, garden spiders, nematodes, snail shells,6 lizard feet,7 and gecko feet.8 It’s as though someone waved a magic wand over each creature and suspended its evolution for 100 million years. Last, even if amber miraculously withstood the ravages of darkening, cracking, erosion, and consumption by microbes, bird-wing tissues turn to mush and dust according to the universal law of entropy. The mummified skin and bone sections of these tiny wings decayed only partially, leaving whitish bubbles containing tissue byproducts in the amber. The study authors wrote, “Details of the ventral wing surface are partially hidden by decay products and inclusions in the amber.”1 After 100 million years, shouldn’t these wings have completely decayed? The feathers, bones, and skin should no longer exist in such recognizable forms if the wing is really millions of years old. These two amber gems preserve evidence of ancient bird life and clearly indicate that those small birds struggled through their last wing flaps in the not-too-distant past—several thousand years ago. Xing, L. et al. 2016. Mummified precocial bird wings in mid-Cretaceous Burmese amber. Nature Communications. 7: 12089. Romey, K. Rare Dinosaur-Era Bird Wings Found Trapped in Amber. National Geographic. Posted on news.nationalgeographic.com June 28, 2016, accessed June 29, 2016. Dunlop, J. A. et al. 2011. Computed tomography recovers data from historical amber: an example from huntsman spiders. Naturwissenschaften. 98 (6): 519-527. Man-made amber is called “synthetic polycommunic acid.” See Hatcher, P. G. and D. J. Clifford. 1997. The organic geochemistry of coal: from plant materials to coal. Organic Geochemistry. 27 (5-6): 262. See references in Thomas, B. 2013. A Review of Original Tissue Fossils and Their Age Implications. In M. Horstemeyer, ed., Proceedings of the Seventh International Conference on Creationism. Pittsburgh, PA: Creation Science Fellowship. Poinar Jr., G. O., K. L. Chambers, and J. Wunderlich. 2013. Micropetasos, a New Genus of Angiosperms from Mid-Cretaceous Burmese Amber. Journal of the Botanical Research Institute of Texas. 7 (2): 745-750. Daza, J. D. et al. 2016. Mid-Cretaceous amber fossils illuminate the past diversity of tropical lizards. Science Advances. 2 (3): e1501080. Thomas, B. Fossilized Gecko Fits Creation Model. Creation Science Update. Posted on ICR.org September 8, 2008, accessed June 30, 2016. Image credit: © 2016 Nature Communications. Adapted for use in accordance with federal copyright (fair use doctrine) law. Usage by ICR does not imply endorsement of copyright holders. Article posted on July 11, 2016. Instead of seeing the obvious ( that this find is thousands not millions of years old ) the EV OE bias is taken for fact right off the bat.